There is a Valencian feel to the front of the Moto3 grid with Jaume Masiá and Aron Canet taking up the first two positions. Masiá, who qualified second at Aragón and in Thailand last season, will start from pole for the first time in his career, with Canet narrowly missing out on repeating the feat from Qatar. Tony Arbolino completes the front row as the fastest of five Italians taking up the next five positions, ahead of Lorenzo dalla Porta, Niccolò Antonelli, Andrea Migno and Romano Fenati. Series leader Kaito Toba is just behind them in eighth. 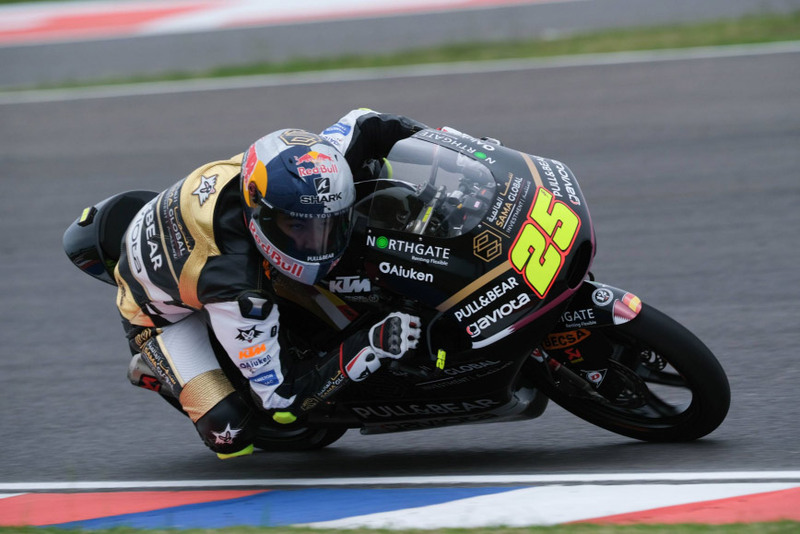 The Sama Qatar Ángel Nieto Team are again in the mix with Raúl Fernández qualifying in tenth position for the second race of the season at Autódromo de Termas de Río Hondo tomorrow. Fernández is doing a great job and is already impressively consistent in just his first season at this level, and he is ready to race tomorrow. His teammate Aleix Viu was unfortunate to crash in FP3, costing him some vital time to learn the bike and the track. Despite the setback, Viu came back to qualify in 25th position, missing out on Q2 by just three tenths. “I am happy with the second day here in Argentina because I was only three tenths off qualifying for Q2, even though this is a new track for me and I missed FP3 after crashing when I hit another rider on the ground. I hurt my hand and my back, so that also made it difficult in qualifying. The team have done a great job to set the bike up for Q1, but on my second run I wasn’t able to get with a group and make use of a slipstream. I am feeling motivated, I dropped two seconds off my lap time from yesterday to today and I know that if I had done the third free practice I would have gone through to Q2”.